TO VIEW MENU…PLEASE CLICK THE 3 LINES TO THE RIGHT OF OUR LOGO. We offer Catering for ANY EVENT! Join us in our dining room where our staff is happy to professionally serve you, or we can bring the food to you! We also have special menus for particular events. Please inquire…we’d love to serve you! YES ! 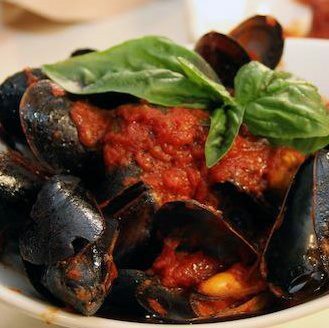 Now THIS is the kind of Italian food I go home all the way to Long Island for. Food- DELICIOUS. I have to say, the spinach and artichoke dip is hands down the best I’ve ever had. Believe me, I order ALOT of spinach and artichoke dip. Thai Calamari… out of this world. Service – excellent. If you want great service and awesome Italian food, go to Francesco’s ! We yelped local pizzeria expecting great pizza (b/c, hey, it’s NY) and found this pizzeria extraordinaire. And there’s no turning back…This is an upscale pizzeria to say the least. There are even other Italian options! They are “skip the diet; tonight’s cheat night…No regrets.Fresh, hot, my mouth is literally watering, delicious food! Go here. Just go. OMG, and the wine is great, too! Duh. Pizza and wine?! Yes please! Had my bridal shower here today and they were very accommodating. The bread was very tasty and even their starter salad was delicious. For the buffet the chicken and eggplant parm were very good, so it was a nice surprise. They cake the also supplied was very pretty and tasty. Impressed considering I’ve never heard of the place before- good food and friendly service. Definitely will be back to check them out for lunch or dinner.